The World’s Coolest Dad — at least, that’s what his T-shirt said — spent part of his Father’s Day at the annual Car Free YYJ celebration on Douglas Street. Jason Rolstone and 14-year-old daughter Katie strolled through the growing throng just before noon to get to a lunch date with his parents. Rolstone said he is a fan of the car-free gathering. Mark Paterson, who answered questions with four-year-old son Finn perched on his shoulders, said Car Free YYJ is great for youngsters like Finn and his seven-year-old sister Arabella. “We like to entertain the kids,” he said. The concept of having a day without cars on a portion of a major city street is worth supporting, Paterson said. The event included four stages over nine blocks from Chatham Street/Caledonia Avenue to Courtney Street. Another dad enjoying Father’s Day at the Douglas Street attraction was Jason Wang, who had five-year-old Noah and Luca, four, in tow. Soaking in the ambiance of a random patch of grass laid out between Johnson Street and Pandora Avenue were Michael Ross and Brenda Hodson, along with dog Tosca. Hodson noted that the little piece of paradise was getting its share of abuse. “Somebody put a cigarette out on it already,” she said. 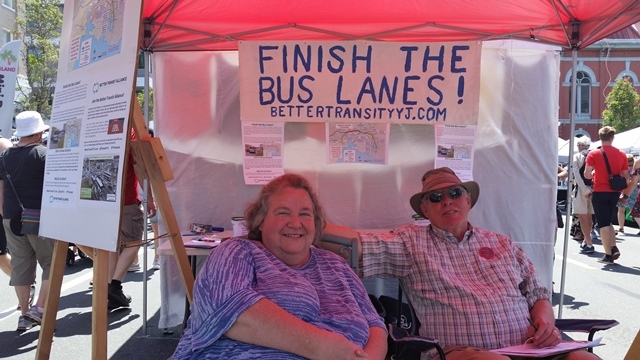 Tying into the car-free theme was a booth set up by the Better Transit Alliance of Greater Victoria, where Eric Doherty was collecting names of people wanting to support the group’s cause. Doherty said some construction is underway, but there is a gap in the lane planning that needs to be addressed. It comes down to priorities, he said. With over 400 vendors and artisans set up for the occasion, Car Free YYJ had everything from used CDs to handmade jewelry to offer. And then there was the Paddlelac booth, where furniture made from paddles was an intriguing sight for passersby. “All it is is paddles and screws and varnish,” said Fred Darlington, who has been at all four Car Free YYJs so far with his creations. Asked where the idea for Paddlelac came from, he said he gives Labatt beer some of the credit. “We lived right on Lake Erie so our deck was right there,” he said. “We had paddles and boards around all the time, and beer around all the time. As many as 35,000 people were expected to attend Car Free YYJ, up from 25,000 last year. Victoria Mayor Lisa Helps said the event has been an unqualified success. Victoria is behind many cities in the amount of time it dedicates to such events, Helps said. She said a pilot project is being worked on by some Government Street merchants who want a portion of the street to be open for pedestrians only on Sundays in August and September.